In the past few years Korean skincare has become extremely popular in the United States, and with good reason. The importation of Korean skincare is great for Americans because we can finally experience some of the best skincare that money has to buy. In Korea there are many, many chemicals and ingredients that are banned (also in the EU and Japan) that are not banned in the United States which makes their skincare much safer and better than our skincare. Also, they have better masks, such as sheet masks which are all the rage right now and great exfoliants that help get rid of extraneous dead skin cells helping to make skin look radiant and bright. 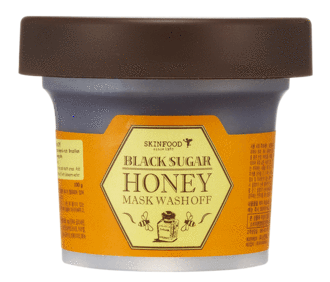 Today I'd like to review one of my favorite exfoliant/masks, SKINFOOD Black Sugar Honey Mask Wash Off. This product is an amazing exfoliant/mask that is AWESOME. It is made primarily from organic Brazilian black sugar and rich moisturizing honey that helps to exfoliate, soften and to hydrate the skin. It is enriched with vitamins and minerals to nourish the skin. Honey is a humectant that attracts moisture to the skin, thus helping to add water from the air and sugar is a natural physical exfoliant that is gentle enough for anyone who does not have acneic skin. It dissolves in water and does not pollute the water system. Also, it is so gentle on the skin but is an excellent exfoliant. This product is applied to damp skin after cleansing and then massaged gently for about one minute. Then let sit for about 10-15 minutes for the honey to do its job and rinse with lukewarm water. Dry skin with a towel and apply serums and moisturizer. If using during the morning make sure to apply SPF. I apply any leftover to my hands and use it on my hands so that they can get the benefits too. After using this mask skin will feel incredibly soft, hydrated and definitely look brighter. Dull skin will be gone and only, newer skin will be in its place. I would use this at least 2-3 times a week as it is so gentle that it can be used often. It can be recommended for almost any skin type except acneic skins with pustules. This kind of mask will help get rid of blackheads, whiteheads and milia. Like I said, it is very gentle. Even sensitive skin can use this. SKINFOOD Black Sugar Honey Mask Wash Off retails for $11.50 on www.skinfood.us. It can also be purchased online at www.ulta.com, www.amazon.com and www.sokoglam.com. Like SKINFOOD on Facebook: https://www.facebook.com/theskinfood.us and Follow SKINFOOD on Instagram: https://www.instagram.com/skinfood_us/.